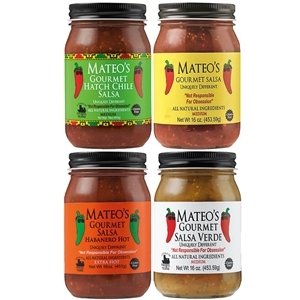 Mateo's line of gourmet salsas is one of our best sellers and staff favorites. Their original salsa comes in mild, medium or hot and if hot isn't enough for you, they also offer an extra hot habanero salsa. Their Salsa Verde and Hatch Chile Salsa are also fantastic and not to be missed! If you are looking for a great gift idea, this four pack gift set is perfect! You get to choose which four items are included and we ship them out in a heavy duty white shipper. A great gift at a great price! Choose from the items listed for the fourth salsa to be included in the gift box.